Is it a wise idea to investigate another new transit technology? Given how long it currently takes for government to decide upon, gather funding for and build a new transit line, should we be adding another step in the process? Do we really want to wait a couple more years for government to decide whether urban gondolas and cable transit are a worthwhile endeavor? An interesting point, certainly, but one that requires some context. The question was asked in relation to Toronto, specifically. The individual pointed out that the city of Toronto had experimented with a new transit technology in the 1980’s and the result has generally been considered a failure. The technology in question was Bombardier’s ICTS technology. The Scarborough Rapid Transit line in Toronto, Canada is one of only a few cities in the world to ever implement ICTS technology. Now rebranded as the Advanced Rapid Transit (ART) vehicle, the ICTS was originally invented, developed and deployed by an Ontario Crown (Government) Corporation known as the Urban Transportation Development Corporation. 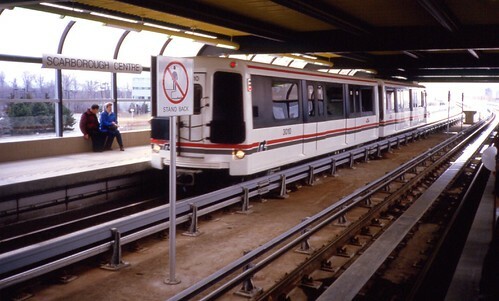 The technology used unique linear induction motors and was the cornerstone of the Ontario government’s strategy to incubate a transportation industry servicing the medium-capacity urban transportation market. Problems with the technology appeared early and the system was implemented in only a handful of cities. Toronto’s harsh winters and heavy snowfall have plagued the ICTS. In Toronto’s situation, the ICTS was forced upon the City by the Province and replaced a plan to use streetcars and/or light rail vehicles instead. The crux of the argument is this: Since Toronto switched from using a proven technology such as light rail to the unproven ICTS and since that experience was such a problem, does it make sense for Toronto to consider yet another new technology such as cable? It’s a once-bitten, twice-shy argument that’s pretty good until you look at it more closely. Firstly, it’s not logical to assume that because the ICTS experience went sour, then so too should experiments with future technologies. It also assumes that had Toronto used Light Rail instead of ICTS, problems would not have occurred. This seems odd considering the general inefficiency of Toronto’s streetcar/Light Rail systems. Secondly, when sold to the city, the ICTS was a technology that had never been implemented or proven anywhere in the world. Cable transit has a long, successful history. Just because a technology is new to you, does not make it new to the world. Thirdly, the ICTS was a vehicle crafted by a government-owned Crown Corporation with little experience in transit technology. The cable industry, however, is privately-held with over 100 years experience and tens of thousands of systems installed worldwide. Comparing cable to the ICTS is not only misleading, it is completely inappropriate. Lastly, the question elevates our traditional transit technologies to some sort of utopian ideal. But they’re not, of course. Each have their own flaws and none work to the extent that we’d wish. Subways are expensive. Buses are unlikeable and expensive in the long-run to operate. Streetcars/Light Rail are slow and inefficient because of their interactions with traffic. To stick with them simply because we’re used to them is one thing. But to actively ignore another technology that might solve some of these flaws simply because it’s new is a whole other issue. Creative Commons image by Bobolink.